With Allred in the lead, attendees can expect some new experiences. The conference is partnering with La Mese delle Donne (A Month of Women) to host a Saturday evening performance. Additionally, this year’s conference is offering a Maker’s Space. “Historically,” Allred explains, “this conference attracts 500-1,000 attendees of all ages, races, backgrounds and beliefs, but I want to expand the demographics even more.” In 2017, the conference program includes speakers ranging in age from 18 to 75 years old. It also boasts speakers and exhibitors from every major world religion, plus a wide variety of spiritual practices. Allred says, “Whether you are interested in social justice as an expression of your faith, contemplative spiritual practice, or just exploring different traditions, this conference is for you.” In an effort to include participants from all walks of life, Allred has also kept registration fees inexpensive. The Maker’s Space, exhibit hall and La Mese delle Donne exhibit are free and appropriate for all ages. Multi-media artist Teaki Garcia conceived and will implement the innovative Maker’s Space at the Women and Spirituality Conference. “As a past attendee,” Garcia begins, “I knew the conference was special. I envisioned an interactive community space where guests could connect and make their own art.” With Allred’s encouragement, and the support of community sponsors, the Maker’s Space is becoming a reality. “The Maker’s Space offers time, resources and support to awaken the creative spirit within us all—a way to keep our passion for life ignited,” Garcia says. Youth and adult volunteers will facilitate personal creative experiences through many different artistic offerings in the southeast corner of the Mayo Civic Center lobby. The interactive, safe space aims to welcome and celebrate diversity, cultural heritage and self-expression. While grant money was secured from The Greater Rochester Arts and Cultural Trust and Rochester Downtown Alliance for art materials, the labor, supervision, teaching and art-making is volunteer-run. The mission of the exhibit is to showcase, promote, connect and collaborate with Minnesota creatives who identify as women. Throughout the conference, tours will be given to conference attendees who wish to view the exhibit at the Rochester Art Center. The curated La Mese delle Donne performance will be held on September 16 from 7-9 p.m. (doors open at 6:30 p.m.) at the Mayo Civic Center and is open to both conference attendees and the general public. Suzanne Szucs with Antares Tribal is curating and organizing the performance aspect of the exhibit. 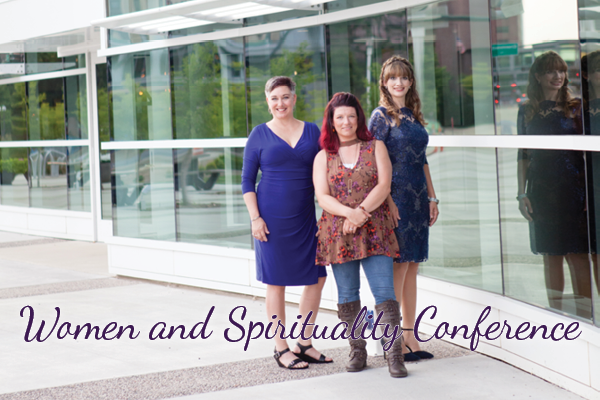 Visit womenandspirituality.org for information on volunteering in exchange for registration, or for scholarship applications. Gina Dewink is a Rochester writer. Her time travel novel, “Time in My Pocket,” debuts September 2017 and is available via ginadewink.com.